The University of Mississippi is proud to announce its incorporation of tricycles as an alternative to the golf carts used by various departments. The tricycles will not only aid in mobility around campus but also aid in health and wellness. Being a non-motor bike, the tricycles will provide an outlet for exercise. The wellness aspect of the tricycles, or trikes, is what creates significance in their incorporation. Wendy Carmean of human resources expressed the basis of the program and how it is beneficial to the Ole Miss community. The idea of the tricycles emerged when RebelWell, the university’s wellness program was awarded a grant from Blue Cross Blue Shield of MS Foundation. The trikes will be outfitted with Ole Miss logos and special tags. 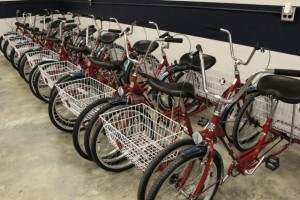 The trikes are red, have large rear baskets and, before distribution to various departments, will have handle bar bells. The tricycles are only for departmental use opposed to student use. Andrea Jekabsons, also an employee of the human resource department, asserted that in addition to trikes, the Department of Parking and Transportation is also providing 50 two-wheeled, logo-covered bikes for student use. The new departmental bike program is planned to kick off with a trike race at 10 a.m. Dec. 1. Five teams will race in a relay format from the University Avenue/Grove Loop intersection around the Circle and back. See highlights from December 1 Trike Race. RebelWell program receives $250,000 from Blue Cross & Blue Shield of Mississippi Foundation. OXFORD, Miss. – With a grant of nearly $250,000, the Blue Cross & Blue Shield of Mississippi Foundation is helping to expand fitness and nutrition programs at the University of Mississippi. The program is designed to help position the university as a leader in programs and initiatives that will improve health, nutrition, exercise and individual wellness. Though the university offers a number of fitness and nutrition options, the overall program lacks the cohesion needed to make all the opportunities easily accessible to faculty, staff, students and the broader community. RebelWell will raise the visibility of many of those programs and expand opportunities for participants to take advantage of a full range of campus- and community-based programs. For example, a nutritionist is being added to the staff of UM’s Department of Nutrition and Hospitality Management, annual fitness challenge competitions are in the works and exercise opportunities are planned for various locations across campus. Health screenings and other events also will be made available to the larger Oxford community. The collaboration across campus and with the Oxford community is a welcome addition to the many departments already on board with nutrition and wellness programs. The Department of Nutrition and Hospitality Management, which already offers healthy cooking classes, nutrition classes and a variety of school-based programs, sees immediate value in these new relationships. Jay Garner, interim chair of the UM Department of Exercise Science and Recreation Management, agrees with the potential this new resource provides. “With the health challenges our state continues to face, our goal is to become the healthiest area in not only Mississippi, but in the Southeast,” Garner said. “This means changing perceptions that daily fitness activity is too difficult or too time consuming. The implementation of grant activities is in the final planning stages, with a full launch expected this spring. The grant covers programs and activities through the end of 2014, with the option for yearly renewal based on the successful attainment of the measurable grant objectives. Faculty and staff at all UM locations will be encouraged to participate in RebelWell. Community residents from the Oxford area also will be encouraged to participate. The committee charged with grant oversight will soon be expanded to include members from a broader range of campus offices, as well as from the Oxford and Lafayette civic, business and school communities. The Blue Cross & Blue Shield of Mississippi Foundation works to build a healthy Mississippi through targeted grant-making throughout the state, focusing on health and wellness initiatives to support schools, communities, colleges and universities. More information is available at http://www.healthiermississippi.org. Athletics Director Ross Bjork will lead a walk on campus Wednesday morning as part of National Walking Day. Athletics Director Ross Bjork will lead a walk on campus Wednesday morning as part of National Walking Day. The walk, which begins at 9 a.m. in front of the Lyceum, kicks off a six-week RebelWell Walking Challenge for UM employees. 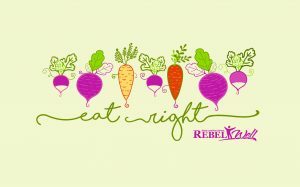 RebelWell is a new program designed to help position the university as a leader in programs and initiatives that will improve health, nutrition, exercise and individual wellness. It is funded by a $250,000 grant from the Blue Cross & Blue Shield of Mississippi Foundation. The RebelWell Walking Challenge encourages UM faculty and staff to walk for 30 minutes each day beginning April 2 through May 13. Each day that you reach the 30-minute goal, your name will be entered into a drawing to win gift cards and prizes, and five winners will be selected. One winning department (based on the highest percentage of people from the same department who participate) will receive a healthy catered lunch. In the event of rain, Wednesday’s walk will take place in the Tad Smith Coliseum. Click here to download the log, and turn it in by noon on May 15 to be entered to win. Winners will be announced May 16.